The Museum’s popular Canada Day Culture Crawl walking tour is back again on July 1st! 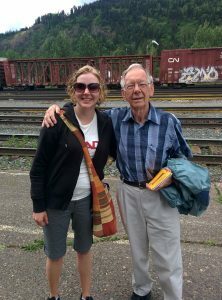 Historian Harry Kruisselbrink and Museum Curator Kira Westby lead participants on a walk through Smithers history, starting at the Central Park Building at 10am and finishing at the GTP/CN rail station. 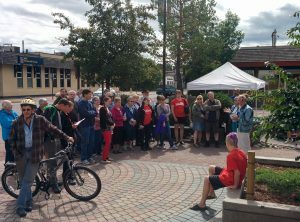 Highlights include a stop at the fire station, the former site of the Bulkley Hotel, Central Square Medical Clinic (built in 1913, and one of the oldest buildings in town), the Old Church, Bovill Square and more! The walk is free, with donations supporting this and other community events greatly appreciated. Please remember to wear your good walking shoes, and to bring water, sunscreen or an umbrella as needed for the weather of the day. See you there! The Interior News: Now available ONLINE! The Museum is generously supported by many local community businesses and associations. For a full list, visit the Get Involved section of our website. Thank you to all of our community supporters!